Genie Jackpots Slots is a highly rewarding slot game which is apparent from the name of the game. This game has an exciting theme that is presented to players in amazing visuals and sounds. The game is themed around a Genie that players will accompany during the game play so he can help them earn great rewards and jackpots. This genie comes out of a magical Arabian lamp, just like Aladdin’s, this is why all of the visuals and the symbols of the game are inspired by the Arab world. These symbols include the golden magical lamp that has the genie, the genie himself, swords, the genie jackpots logo of the game, a wild monkey symbol, a Sultan’s crown and card symbols that represent the video slot’s low paying icons. Speaking of payouts, players will be able to view all of the different payouts that each symbol has to offer by opening the paytable of the slot game. They can do that as they click on the paytable button that can be found under the reels. It will not only show players how much can each symbol give them, as it can also give them an idea on the bonuses, jackpots and the special features that some of the symbols have. All what players have to do in order to enjoy this experience and spin the reels is place a bet through the Bet cell under the reels and then clicking on the spin button that comes in the shape of a golden lamp so the reels can start spinning. They can also choose up to 100 spins through the Auto Play feature so they don’t have to click on the spin button every round. The Wild Monkey icon is one of the special icons of the game. This wild icon has the ability to substitute any of the game’s other icons so players can have a better chance at forming a high paying combo. There is also the bonus icon that can trigger bonus rounds. For example, if players get 2x bonus icons + the bonus chest icon, they are going to trigger the Mystery Win bonus in which they will win a mysterious prize from the treasure chest of the genie. Players will be able to earn up to 100x their total wager. Another bonus is triggered with the help of the bonus icons if 2x bonus icons appear + the magical bonus carpet. This will trigger the Magic Carpet Bonus. It is a mini game where players will control a donkey and try to advance so they can earn great rewards. Last but not least, there is the 3 Wishes Power Spin, which can be triggered randomly during any spin. 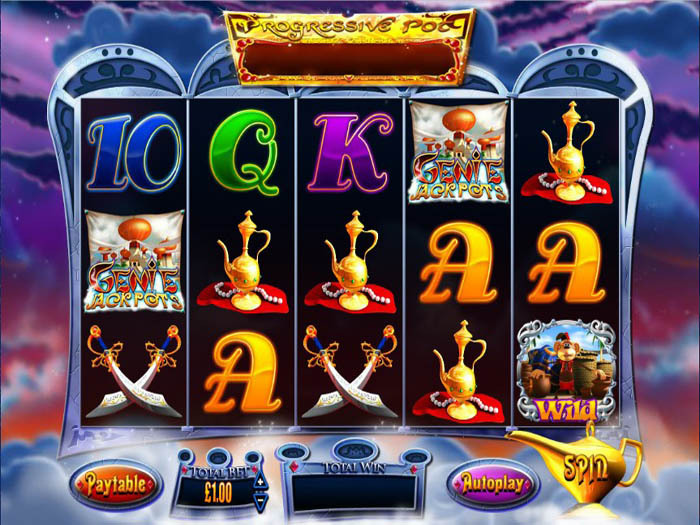 It would give players the ability to select a lamp to reveal one of the many great wishes such as the progressive jackpot, the genie wilds respins and the bonus features. Genie Jackpots has lots of great bonus features and the ability to unlock a secret bonus level. Awesome graphics and slot characters trigger bonuses, secret levels, and big payouts. Tons of fun!